Hunting down solid ethnic food in Rome seems at times like a bridge too far. Sure, you’ll find some decent Chinese near Piazza Vittorio and a smattering of fine Eritrean and Ethiopian fare, but Thai demands a special touch. Salathai has what it takes. Here are four reasons why. The pad thai is excellent, not overzealously spiked with garlic. The chicken saté actually takes the chicken seriously, marinating the meat so that the peanut sauce compliments it, rather than merely softening. The tom ka gai (chicken coconut soup) is the real thing, with a nice hint of ginger. The cashew chicken, lo and behold, contains cashews you can taste. Small favors, you say. Maybe. But this is Rome, not New York. The dining area itself is luminous, minimalist, but the tables arranged in a way to ensure diner privacy. Service is attentive, not cloying: If anything, they come at you too quickly. 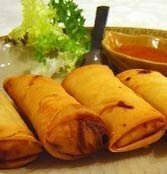 In addition to the top 4, the spring rolls are light and crispy (involtini primavera on the menu). The curries, green or eggplant curry, red with with chicken and shoots (kaeng nar mai) and beef curry (phan aeng) are all dependable. There’s Singha beer and a Spartan wine list. Writing in Corriere della Sera in 2006, Luca Zanini dubbed Salathai “the best such restaurant in the city,” with the caveat that Rome doesn’t hold a candle to London or New York. Fair enough, but we’ll add another one: It’s better than it was in 2006. Expect to spend about €40 a head. Salathai is in the Trieste neighborhood of north Rome, about 15 minutes from the center. (If you give the Thai Embassy a call and ask them where to go, this is their answer.) Dinner only.